That's a specific output twice as high as the most potent road cars. Downsizing and turbocharging are the order of the day – at least as much as electrification. Audi knows this as well as any other automaker in the business, and it's just revealed its most potent little engine yet. Shame none of us will get to drive it. This 2.0-liter turbo four kicks out over 610 horsepower, giving it a specific output of 305 horsepower per liter. That's about twice the specific output that Honda gets out of the same-size engine in the Civic Type R.
The highly stressed 3.9-liter twin-turbo V8 in the Ferrari F8 Tributo "only” produces 182 hp/liter. 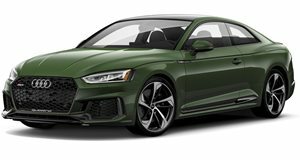 In context of Audi engines, this engine also handsomely outperforms the 2.5-liter turbocharged inline-five in the RS3 and TT RS (with 160 hp/liter). Even the Mercedes-AMG CLA45 and GLA45 (with the same-size engine) "only” produces 375 hp, or 187.5 hp/liter – and that's the highest specific output in the business. But those are all road cars. And this engine, we're sorry to say, is not powering anything you can drive on the road. Audi developed the racing engine for the RS5 it will campaign in Germany's DTM series. The series has long served as a technological showcase and proving ground for participating manufacturers. This season it switches from the previous V8 engines to the smaller turbo fours. Audi's produces as much as 640 hp on push-to-pass overboost – and it still has to last for a full season, or about 3,700 miles. What's more is that the engine only weighs 85 kilograms (or 187 pounds) – about half of what the old V8s weighed, giving the vehicle a dry weight of less than 1,000 kilos (2,205 lbs). So don't be surprised if lap times start falling this season as a result.